Among the TV series I enjoy there is a comedy one that I've always admired for its clever puns. Lately I got to see the latest season but after it ended, the TV channel aired the first episodes from 2007. I've watched those before, a bunch of years ago. I remembered the story but... I forgot they were somewhat lame! I'm not saying they weren't good but compared to the latest seasons you can't avoid thinking that their puns are a bit dumb... What a shock! But this made me think about my "perfectionism issue". First episodes were enjoyable anyway, even if not perfect, even if characters would say dumb things because characterization were still in the making. I realized that was totally fine. As long as it's decent and enjoyable, it is okay. However, by observing pros I realized that "perfectionism" eats a lot of time and energy out of you in this case as well. This means that making things "untidy but working" at times is okay. And I'm now ready to embrace this philosophy as well! As soon as the game works, why not! Lately, brainstorming about glitches in games I got to browse the infinite placeholders in Pokemon games and... gosh, that was educational! 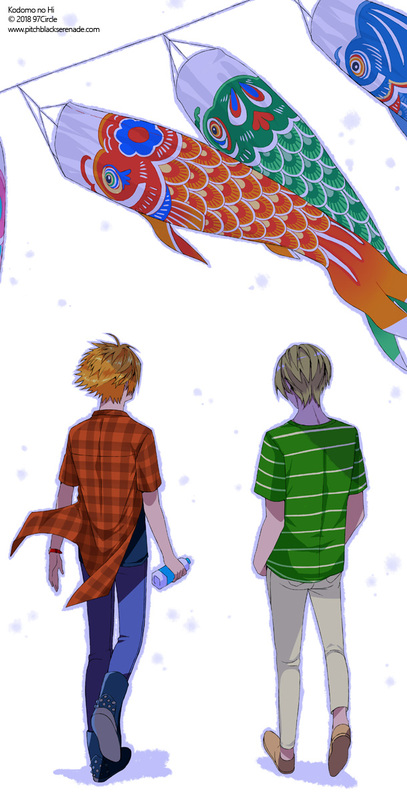 Bye bye, Golden Week～ Shin and Kairi enjoyed the last day by taking a walk under the carp streamers.🎏 Click to enlarge it or go check the Gallery section for more artworks! Their body type is different! Kairi has a rather linear build and he's neither too slim neither he gets fat just with an extra portion of food. Shin is skinny, with narrow shoulders and it's almost impossible for him to gain weight. I'm on my way to hand over half of the script for the proofreading so... during next week I'll be working on finalizing the assets I'll need for that portion of demo.